Mort Künstler Hand Signed and Numbered Limited Edition Print:"An Apple for Traveller"
Image Dimensions: Limited Edition Print Image size: 17" x 23" / Overall size: 22" x 27" Canvas Sizes: 21" x 28", 27" x 36" and 36" x 48". 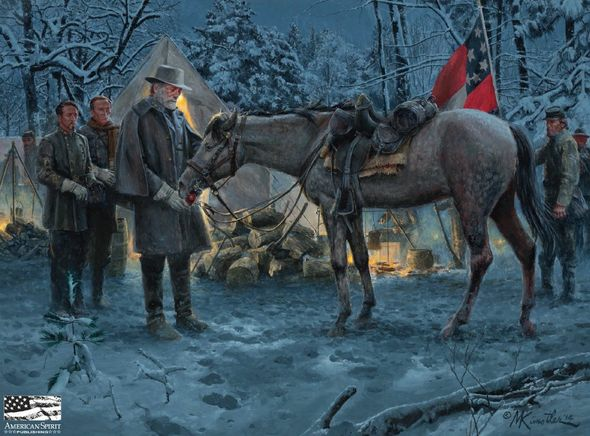 About the Edition : The 2014 Snow Print Release marks the 7th of 8 final releases from Mort Künstler Civil War editions to coincide with the 150th anniversary of the end of the civil war on April 9th, 2015. About the Art : There are few relationships more appreciated than that of a horse soldier and his mount. During the American Civil War, over a million horses perished in service to their respective causes. Few of them are remembered and revered today as much as Robert E. Lee's horse, Traveller. Buried at Lee Chapel, at the same site as his commander, this dappled grey American Saddlebred was known for his speed, strength and courage in combat. Lee acquired him in 1862, and rode him throughout the war and beyond. "If I was an artist like you, I would draw a true picture of Traveller; representing his fine proportions, muscular figure, deep chest, short back, strong haunches, flat legs, small head, broad forehead, delicate ears, quick eye, small feet, and black mane and tail. Such a picture would inspire a poet, whose genius could then depict his worth, and describe his endurance of toil, hunger, thirst, heat and cold; and the dangers and suffering through which he has passed. He could dilate upon his sagacity and affection, and his invariable response to every wish of his rider. He might even imagine his thoughts through the long night-marches and days of the battle through which he has passed." One of my favorite images to paint each year is my annual snow scene. Usually released around the holidays, this piece incorporates some of my favorite lighting and composition techniques. It is therefore no surprise that I have given an enormous amount of thought to what will probably be my last Civil War snow scene. I also took a slightly different angle. Instead of searching for a specific and significant sight as a backdrop for this number VII of VIII in the "Legends" series, I decided to paint a scene that could have taken place on any winter night during the war. Robert E. Lee was known for his kindness to animals as well as people and his thoughtfulness was legendary. That accolade formed the inspiration for this painting which gave me the opportunity to capture the relationship between the general and his faithful horse Traveller. With this scene, I felt that I could depict his sincerity and capture a brief moment of serenity amidst the perils of war. I emphasized Lee and Traveller by making them the primary center of interest by utilizing the lamplight of the tent and the light from the campfires. I used small amounts of warm color to contrast with the large areas of cool blues, to focus the viewer's eyes on Lee and his fabled horse. I also used the breath of Traveller to lighten the area around the apple, and the red of the apple to further enhance the story. The first National flag is used as a color accent as well as identifying the scene as a Confederate camp. On numerous occasions during the Civil War, especially at night, riders rode with the enemy without knowing it. No thank you, I just want the 17x23 unframed print.